This holiday season brought in a lot of sales, especially with cell phones. People asked Santa for a lot of things this year, but Android and Apple products sat snugly on top. So how did they do? First we’ll have to look at how they did together. According to an article published in Fortune, Flurry Analytics reports a total of 6.8 million iOS and Android devices were activated worldwide on Christmas Day alone. That’s a 353% increase from Christmas last year. Now, let’s look what Google’s numbers are. Andy Rubin, senior vice president of Google’s mobile department, sent out a tweet recently. He claimed 3.7 million Android devices were activated on Christmas Eve and Christmas Day. That’s a nice jump from the number Google reported last week. In a tweet, once more, Rubin reported the number of Android activations were 700,000 daily. 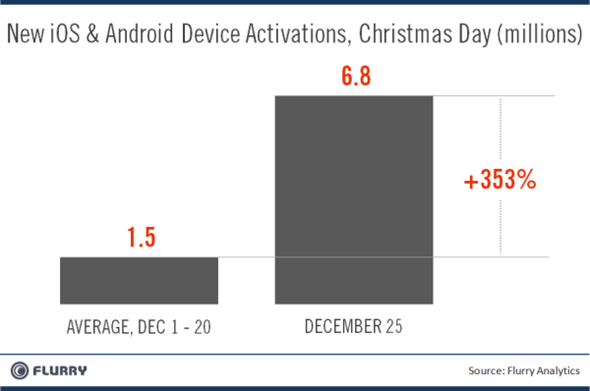 So let’s assume that Google activated their current daily average of Android activations on Christmas Eve. 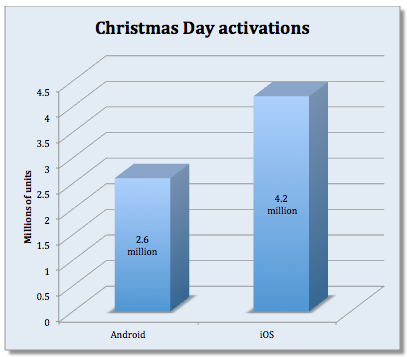 If we can trust Rubin’s and Flurry’s numbers, then we’re left over with 3 million Android activations on Christmas day. The number may be less, but for all intents and purposes, we’ll give Android 3 million, still. Figuring out Apple’s number is now a matter of simple math. Flurry Analytics reported a total of 6.8 million devices were activated between the two. Based on the series of tweets, Android’s slice of the pie covers 3 million –that leaves 3.8 belonging to Apple. A key thing to remember is that cell phones are not the only ones contributing to the activations. Android’s 3G tablets, such as the Galaxy Tab series, and Apple’s iPod touch and iPad models are all moneymaking sidekicks. Looking at numbers alone, and only during Christmastime, Apple is the clear winner here. They sold just about a million units over Android, a feat they have not accomplished until now. The holiday rush is now over, however, and with Android’s true versatility, the operating system may jump ahead once more, leaving Apple in the dust once again. 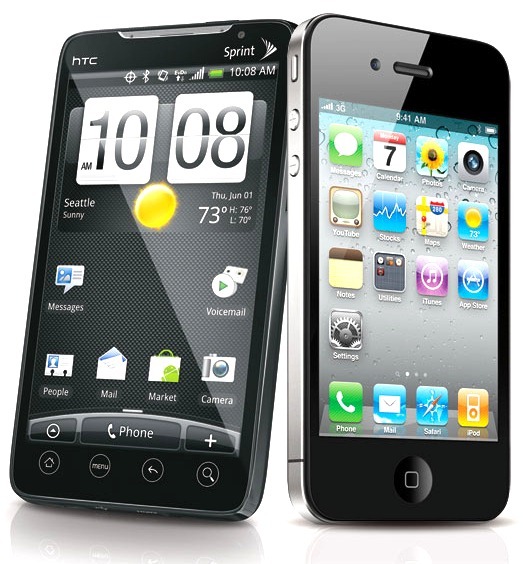 The Android operating system has consistently outsold iPhones worldwide by a three to one ratio. A key reason for Apple’s success here, is due to the iPad and iPod touch being such popular gifts. Since this is all speculations and math, based on tweets and reports, we’ll get back to see how accurate our predictions are when the official numbers are released.